You may have the urge to check whether you are receiving the Internet speed as promised by your Internet Service Provider (ISP). After completion of your Internet speed test online, you are stumped. You do not understand the terms used to describe your Internet speed. Are you getting the bandwidth you are paying for? In order to answer these and many other questions let us see how to interpret Internet speed tests results from the following paragraphs. 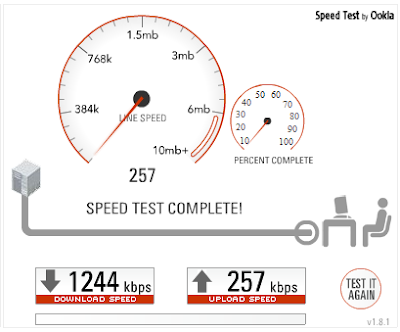 Now, there are certain terms that are used by an Internet speed test. These common terms are explained below and will help you understand your Internet speed test results better. The download speed helps you understand how quickly the Internet data is transferred from a server to your computer or a home network. The download speed is measured in Mbps (megabits/second). An upload speed helps you know how fast you can send data to others. This information is important as it helps you know how fast you can upload or send big files via email, or carry on with a video-chat, etc. The upload speed is also measured in megabits/second (Mbps). A ping is the reaction time of your connection to a request. In other words, it is the latency period of your computer network. It represents the amount of time taken for the data to get transferred from one computer to another network. Faster the ping, the more competent is your connection. A ping is measured in milliseconds (ms). What is the Most Important Aspect of Internet Speed Results? The most important thing to note for your Internet speed result is the download speed. It is the key to understand is the ISP is providing you the level of service as promised. You should keep in mind that the home router usually connects multiple device to a single Internet connection. This definitely affects the overall streaming performance of your connection. You should perform regular Internet speed tests to give you a basic idea of the data that is delivered to you, before you start seeking for solutions to overcome slow Internet speed.